Mr Gums and I have had a busy few months, with, unusually for us, two overseas trips in less than four months. Both were family-inspired: Canada in April-May to visit our daughter, and then last week Koh Samui to help Mr Gums’ sister and husband celebrate their 40th anniversary. We decided to spend a few days en route to Samui in Singapore. What an interesting place it is. Although, technically, a new country which will celebrate its 50th anniversary next year, it has a much longer history, dating back to the second century. What we know as “modern” Singapore, though, began when the British, via Sir Stamford Raffles, established a trading post on the island in 1819. 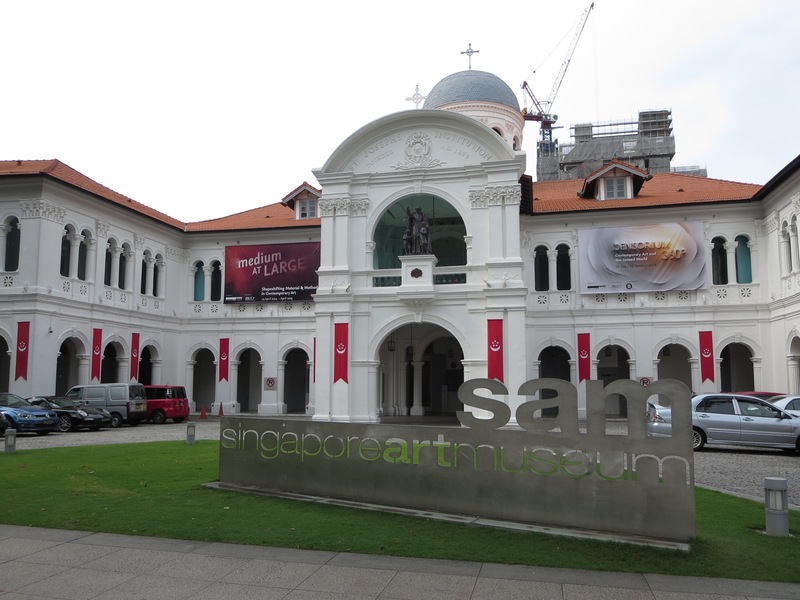 We didn’t see anywhere near enough but we tasted its variety – including my topic for this post, the Singapore Art Museum (SAM). SAM is housed in a gracious old 19th century missionary school building – the St Joseph’s Institution run by La Salle Brothers. The building was constructed in stages, from 1855 to completion in the early twentieth century. It was acquired for the museum in 1992. SAM describes itself as having “one of the world’s largest public collections of modern and contemporary Southeast Asian artworks, with a growing component in international contemporary art”. explores the idea of medium in contemporary art, probing some of the most fundamental and pressing questions of art – its making, and also our experience, encounter and understanding of it. It’s the sort of exhibition I enjoy – modern, confronting and/or provocative, with useful interpretive signage. Of course, I enjoy the famous, classic galleries like the Louvre or Prado, just as I like to read classic novels, but I also enjoy seeing what contemporary artists are doing and thinking. I loved the concept behind this exhibition. In our increasingly fluid, interactive, interdisciplinary world, a focus on how art is made and how re relate to it, seems very relevant. The exhibition comprises 32 artworks and apparently draws mainly from the museum’s permanent collection, but it also “includes loans and commissions from Singaporean, Southeast Asia, and Asian artists”. We are seeing more Asian artists here in Australia, but it’s exciting to visit Asian galleries where we can see art and artists less familiar to western gallery-goers. And so, we saw two portraits made using live bullets on sandpaper (by Filipino artist Alvin Zafra), and a sculpture made with human hair (Dutch-born Indonesian artist Mella Jaarsma’s Shaggy). We saw works that play with medium and form, such as an oil painting overlaid with a video projection (Indian artist Ranbir Kaleka’s He was a good man), a distressingly mesmerising video of a woman dancing on butter captured also in still photographs (Indonesian artist Melati Suryodarmo’s Exegie – Butter Dance), and another video in which a taut rope springs and snaps through architectural spaces (Singaporean Chen Sai Hua Kuan’s Space Drawing 5). Our minds were challenged by a video installation called The Cloud of Unknowing (by another Singaporean Ho Tzu Nyen) in which various residents in an apartment complex experience some sort of epiphany or understanding of something mystical. Some of the works, including this last one, have been exhibited at the Venice Biennale. But, since this is primarily a litblog, I’ll finish with two works that incorporate books. 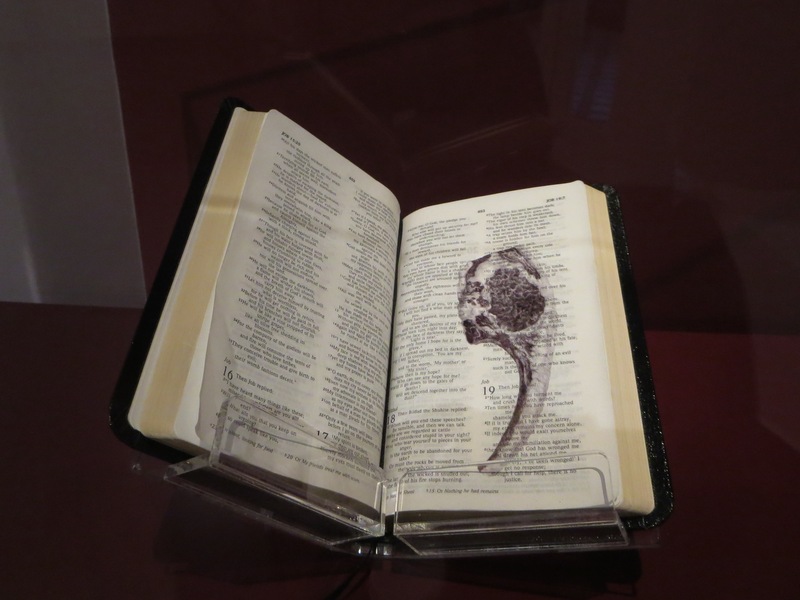 The first one is, in fact, the first work that confronted us in the exhibition, Filipino Renato Orara’s* Bookwork: NIV Compact Thinline Bible (page 403). It comprises a lamb cutlet, finely drawn in ballpoint pen on a page of the Bible, a page from Job. Since Job is primarily about how humans can comprehend why an all-powerful God lets good people suffer, the piece raises all sorts of questions about “the lamb of God”, about sacrifice. The label suggests other tensions too, such as between word and image, between open/public (when the book is open) and hidden/private (when the book is closed), and, through imposing what is essentially a chop on the Bible, between the sacred and profane. I would add another tension – that between wonder at the delicacy of the execution of the image and feeling “gross” from seeing a lump of fatty meat on the Bible. A surprising work that stays with you. The other work, Titarubi’s Shadow of surrender, comprises multiple components in a large space. I could not quite fit it all into my photo but it contains large, open, blank books on benches, with chairs, and with big charcoal drawings of trees on the walls. It was commissioned for the Indonesian pavilion at the 2013 Venice Biennale. It’s a complex work, with additional layers of meaning contained in the knowledge that the wood used in the furniture comes from colonial-era railroad tracks. The pieces are burnt, which apparently references the charcoal the artist’s mother cooked with, but which also links to the charcoal tree drawings. And, of course, trees provide the paper and wood used for books and furniture, suggesting a cycle of life theme too. The label refers to the fact that the books are empty implying a “tabula rasa” and the idea that it is time to re-write history or re-learn lessons, and thus develop anew leaving past colonial constructs. An article about the Biennale on Titarubi’s website says that in this work he links “sakti” (‘divine energy”) “to both education and the environment, to knowledge and the natural world”. Another powerful and emotive piece, as you can see. SAM was our last “sight” in Singapore and rounded off our visit very nicely! * While researching where Orara was from, I discovered an article about artists using ballpoint pens. It starts with: “Accessible and affordable, the ballpoint pen has become the medium of choice for artists to make obsessive abstractions, extreme drawings, and playful riffs on venerated ink traditions”. Hi, I’m glad you and Mr. Gums enjoyed your Singapore moments. I was not crazy about the place the first time I went, but really got to like it the other two times. I would gladly go back again, I feel I still have a lot to discover. Thanks Sylvie. I can imagine what you say, but it’s surprisingly rich in things to do …. and in variety … for such a small place, isn’t it? We’d go again as we by no means got to everything we’d like to see … The heat and humidity does slow you down a bit I think. What a beautifully word-drawn description of your SAM visit. Too long ago since I spent time IN Singapore. Though I might counter your visit with my own recent visits to Seoul and Hong Kong, Adelaide and Darwin – and this past week or so in Sydney (Archibalds, Wynne, Sulman – Noh/Kyōgen – Great War diaries/letters) plus an exhibition from Lucas GROGAN at the Martin Browne Contemporary Gallery in Paddington and of his recent Art Installation (250,000 glass beads in rows of strands – five-hues of blues – from palest to deepest – this all backed by a mirror – suggesting water falling/rain/flowing river) in the foyer of the TransGrid energy company – 180 Thomas St Ultimo – just across from the nearly completed Frank GEHRY UTS building! Thanks Jim … I need to get to Sydney again to check some galleries. That Grogan work sound stunning. Loved this post, and especially your thoughts about the ‘book’ art. Thanks Lisa … it’s such a lovely museum isn’t it? Regarding Renata Orara’s ‘Bookwork’ I am not sure the lamb chop in the Bible represents any tension between the sacred and the profane. In Judaism the lamb which was always male and a perfect specimen was, and no doubt still is, regarded as the perfect sacrifice (therefore sacred). The idea of a drawn chop, rather than a drawn lamb I think is meant to represent the death of the lamb, therefore the sacrifice made. There is shock value in seeing such a representation but then isn’t such art meant to shock us into thinking more deeply? Thanks LL for your great comments. Yes I do think it is the intent of such art. Re sacred and profane … I think the profane probably stems from two things – the fact that he has used a chop rather than the more usual lamb, and the act of defacing the Bible. But I agree that using the chop does also conjure the idea of blood and sacrifice. I think it’s these layers that make the work provocative and catching. You know, I was in Singapore for a couple of days some decades ago. Never had the chance to revisit. Do you go there often? Do you feel the changes (if any) of the country? This art museum looks like a wonderful place to visit. Thanks for the informative descriptions of the exhibits with which I’m not familiar at all. No, Arti, this was my first trip which was why we decided to add it to the trip to Koh Samui. I’m not a big fan of SE Asia – primarily for climate reasons. Humidity does not do well with eczema which is the bane of my life! My husband had been there once before – before I met him – in the mid 70s. He noticed a huge change. The “new” country would have been around or just under a decade then and was still very “colonial” in look. It is now a very modern, very clean, very safe place, though one with a lot of variety too from the ultra modern to very traditional areas. But there are costs I think in some very strict rules and regulations. If you are law-abiding you are fine but I think “law-abiding” does include loss of rights. In any society, individual rights do need to be balanced by the rights of others, but my sense is in Singapore it is taken further than we westerners would like and penalties for infringement can be harsher. It made us think a lot. Yes, the no gum chewing law is ‘infamous’. And, a few years back, a Canadian youth was charged with vandalism, and had to receive 200 lashes as punishment. The people here had urged our PM to appeal for the kid. Anyway, those are ‘common’ tales, but more recently I’ve heard about the Lee Family has lost its influence in recent years. So politically speaking, the country might go down an unstable path. It probably has to happen as new generations demand more and develop the monetary clout to expect it. We were intrigued that foreigners can go into casinos – with passports and decent dress – but locals have to pay $100 each visit … Aim is to prevent gambling addiction. There’s a lot of exhortation to think of others, too, which is good but it can trip over into social control … An interesting place that really made me think. I have put forward your name and blog on my page as a Most Inspiring Blogger. If you wish to participate I’m sure people would enjoy it. You really are a good inspiration and all a good blogger should be. Hi Pam, thanks, that’s really nice of you. I’m not sure what “Most Inspiring Blogger” is however so will come over and have a look. Did you have a good visit here in Canada? Hopefully things had warmed up for your arrival. Enjoyed this post. What a lovely building. Oh thanks Sue, yes we did, though it was colder than we hoped for in late April early May. We’ve been to Canada a few times – Nova Scotia, New Brunswick and Quebec in 1983, British Columbia in 1991, and then Toronto (with a weekend in Montreal) this year. A great country. What a marvelous trip! The museum sounds really wonderful. You got to see some very interesting things from the sound of it. I do enjoy art that challenges one to see things a bit differently. Thanks Stefanie … It was short but sweet, the trip I mean! I love visiting different art galleries. I visited Singapore for the first time earlier this year. Loved it, not least because it felt like I caught a glimpse there of the future. Whether or not that’s the future I hope for is another thing, though! As a result of that trip I’m now reading (and enjoying) “Raffles and the Golden Opportunity” by well-known English biographer Victoria Glendinning. Oh that sounds good MST … I’ve read a book by her, but a long time ago. I’ll add that to my list of books to read because I could imagine revisiting Singapore again. Like you this was my first trip. My husband had been there before but in the mid 1970s when it was very colonial in look still. 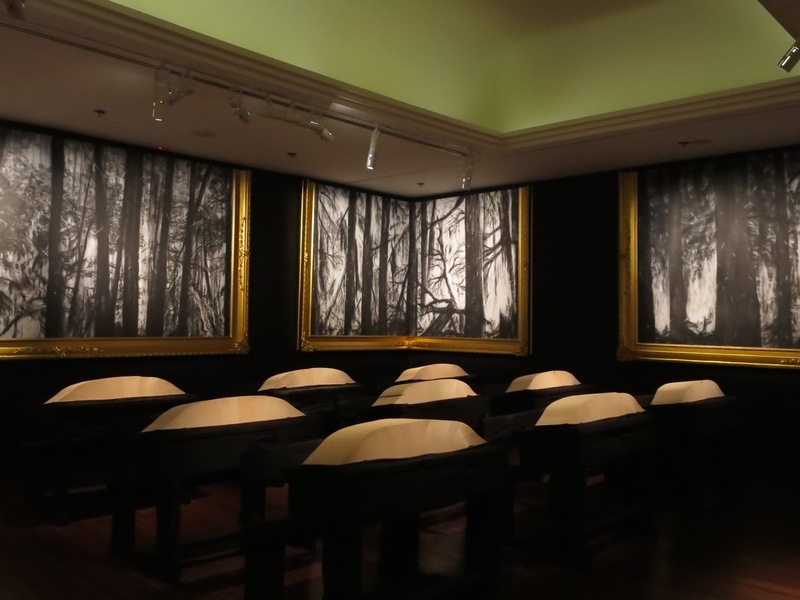 Thank you for this review – another Singapore museum for me to check out! I first went to Singapore in the mid 1970s when I was a child. Now I am back here I’m getting some flashbacks of places I had forgotten about. When I am standing in the place I suddenly remember a childhood experience that I had previously forgotten, eg the food stalls in Little India. Sometimes it’s hard to go back, eh? We didn’t get to Little India. So many places and so little time. Who knows we may go again en route to Europe. Anyhow, I do recommend SAM. Lovely building, and a nice complex. We stayed around the corner in Victoria Road so it was walking distance for us, which was nice.